This functionality saves your time and ensures that you have included all the course attendees and you didn't forget any of them. This functionality also allows to merge users and teachers or team leaders together in case they don't see the users due to low level of system access rights. Groups are created and maintained in the Groups module, all user mass operations are done in the Users module. Create Group in the Administration / Groups module, click Create new group and add the name of the group. 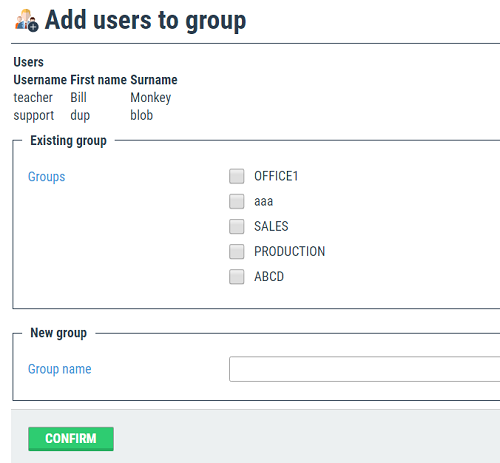 Go back to the Administration / Users module, select the users you want to add to the group and click Add to group, the selection window appears, pick the groups or create new entry to be assigned to the selected users and confirm. The similar process is done for users ungrouping, just use the Remove from group function. In the users module use the column Group, search field. Fill in the group name you want to filter, the field supports fulltext and you may just add part of the name only, click Filter. The filter will be applied and only the relevant entries will be shown. Select the users you want to manage. You still may select some of them or all by using Select all records select box. Edited 5 time(s). Last edit at 03/29/2017 09:44PM by admin_admin.